For the past 25 years, attorney Mark A. Brown has been honing his skills as a litigator and gaining a wide range of legal experience, all while helping numerous families and individuals who have suffered an injury, accident, or abuse. He dedicates his time, passion, and energy to his clients and to upholding the law. Mark has also provided legal commentary for the Daily Herald newspaper and appeared on the PBS TV show, Chicago Tonight, discussing sexual assault and abuse cases. 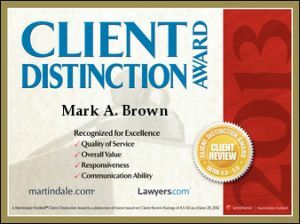 Since receiving his law degree in 1993, Mark Brown has practiced as a plaintiff's civil litigation attorney, concentrating in medical malpractice, catastrophic and complex personal injury actions, and sexual abuse cases in state and federal courts. Since he joined the Law Offices of Lane & Lane in 2002, he has helped hundreds of clients with personal injury claims, medical malpractice cases, product liability lawsuits, and sexual abuse cases. Mark graduated from the University of Illinois – Champaign-Urbana in 1989 with a major in Economics and a minor in Business. He then attended the Kent College of Law at the Illinois Institute of Technology from 1990-1993. There, he was president of the Decalogue Society and on the Dean’s List. Mark's experience includes argument of a medical malpractice case in front of the Illinois Supreme Court at age 34, the preparation of several Appellate briefs, as well as numerous jury trials and mediations involving serious personal injury and medical malpractice. For the years 2010-2018, Mark was selected by his peers as an Illinois Personal Injury SuperLawyer, an honor given to only five percent of the field. He has also been recognized as one of America's Most Honored Professionals. In 2007, Mark was recognized by the Chicago Daily Law Bulletin as one of the 40 Under 40 Attorneys to Watch in Illinois. Mark spends much of his time outside of the office with his wife and three sons. He enjoys playing and collecting guitars. Mark also acts as executive vice president of the Executives Guild Ltd., a Chicago-area business association.